Since buildings and businesses have vastly different roofing needs, your roofing company must have extensive experience in understand the engineering behind your property structure. Understanding the mechanics of your building and industry is a fundamental objective, and the commitment to this over the years is the reason we are able to work across industries while delivering solutions for your building, budget, and needs. Whether your building is new or old, sloped or flat, large or small, our Atlanta roofing contractors have experience across their unique attributes, construction components, and functionality requirements. Reducing the presence of a repair or replacement project is critical for REITS and retail owners. Safety, cleanliness, and limiting inconvenience to customers and employees are priorities during retail roofing projects. Residents occupy condos, so a repair or re-roofing job must involve keeping condo owners pleased. Our project managers understand this, and facilitate a flawless project that’s without disruptions and on time. 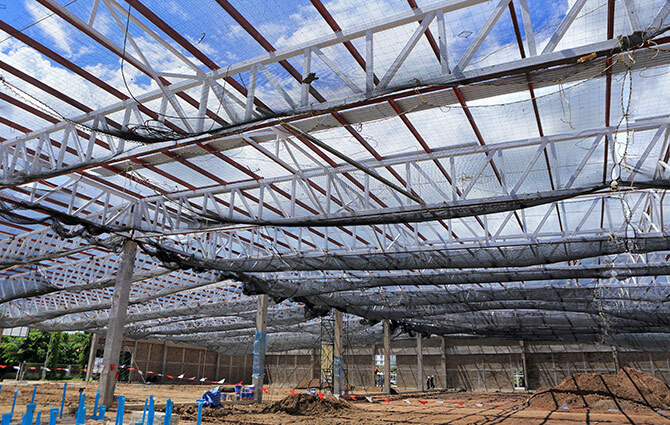 A warehouse roof can be a large energy inefficiency. Thus, analyzing the appropriate roof, life-cycle cost, and factoring long-term ownership versus a short-term lease are key factors in determining the best solution. Faculty and student safety, liability, and cleanliness are factors that are prioritized during such roofing projects. Educational facilities have tight deadlines to be met, and need a dependable expert for ongoing support. Because business in commercial office buildings cannot be interrupted, the roofing project must be well-managed, on-time, and minimally disruptive. All of which we produce for high rise and single-story office buildings. Patrons of hotels and occupied buildings demand cleanliness and comfort. In addition to a flawless repair or installation, eliminating interruption while maintaining a clean and safe facility are pre-requisites for hospitality projects. Though these projects can be complete tear-offs or membrane replacements, meeting production demands is a priority that can’t be interrupted. No stranger to these, we select the ideal system and manage the job to meet all goals. Many health care facilities not only operate 24/7, but have strict code regulations and require sterile and comfortable environments for patients. This means zero tolerance for leaks, a controlled installation, and an extremely durable roof system. We operate under the fundamental truth that your roof not only protects your building, equipment, and people, but when selected and installed properly, it saves you money and increases the value of your property. Thus, everything we do is focused on sourcing the highest-quality materials that provide maximum value, and executing the application seamlessly. Simply put, we believe in using the best materials in commercial roofing, while providing the most competitive prices in Atlanta. Request a Free Evaluation, or call now to address anything related to repairing or replacing your commercial roof.